Works in the “ACS-X” series explore the relationship between context and duplicity. 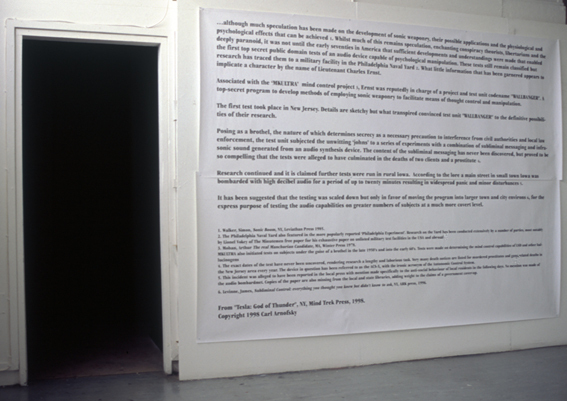 Presenting the viewer with a large scale text detailing specific narratives around the development of a secret military thought control weapon, the work creates and manipulates a context within which is presented an abstract audio work. The audio is played at high volume and, as advised on the entrance to the blackout enclosure, contains subliminal messages. The work examines not only what we are presented with as information but how it is presented to us. The vernacular of conspiracy theory is appropriated to construct a suitable fiction for the preparation of the viewer, while the text is a fabrication the subliminal messages are not.